I figured that hell would freeze over before I saw gigabit fiber here, but sometimes there’s a surprise. 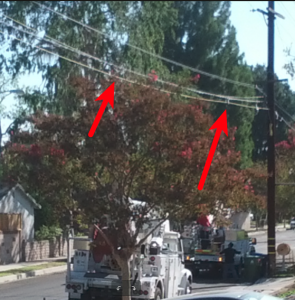 The photo below shows AT&T preparing to pull gigabit fiber to the home (“GigaPower”) down my street. This will be a trunk line since actual drops and demarcation points for where I am in my corner of L.A. are behind the houses, so feed lines will be run behind the houses as subscribers request installs. It’s a bit difficult to see due to the lighting, but the left arrow points at a yellow “pull cord” that AT&T brought by in front of my house yesterday and is continuing to run today down the street. The right arrow points to a pulley assembly hanging from the Time Warner Cable (now aka Charter/Spectrum) trunk cable above, with the pull cord threaded through it. The GigaPower fiber run will be fed from a large truck spool that will be parked nearby and then pulled down the street over the pulleys via the pull cord. The spool feeding the pull cord itself is visible near the AT&T trucks at the lower right. AT&T’s pricing for their GigaPower offering varies widely depending on whether or not they have fiber competition (e.g., from Google Fiber — which isn’t here currently). AT&T also usually charges considerably more for GigaPower if you don’t want them snooping on your web browsing activities. That all said, it’s likely to be a damned sight faster than the comparatively crawling (especially upstream) speeds from TWC currently! I’d still much rather have Google Fiber, though.